First-class travel. Incomparable luxury. Sun-soaked decks. Immaculate interiors. Endless amenities. Each are hallmarks of the yachting lifestyle, one that pushes the boundaries of exploration and reveals a whole new world of possibilities on the water. With features like movie theaters, concert halls, swimming pools, tennis courts, hot tubs and more, why stop there? These yachts were built to have it all, and they do. So if you’re sipping your morning coffee while taking in the sunrise over the Mediterranean, what better way to savor the moment than knowing you arrived hours before via helicopter from your private jet. Here, we’ll look at a handful of these helicopter-ready behemoths that standout in a field of globe trotting superyachts. LUNA | 115m Explorer Yacht – She might be better known for making headlines when the megayacht was seized in Dubai last year as judges in a London court sought to enforce one of the largest divorce pay-outs in history. But LUNA is a stunning example of what can be done onboard a yacht of her size, something that’s confirmed by her massive swimming pool, one of the largest ever fitted to a superyacht, and her two, not one, helipads available on the upper deck. ATTESSA IV | 101m Dennis Washington Superyacht – Originally built by owner Chang Yung-fa, chairman of the Taiwanese Evergreen Group, at a commercial yard in Japan, ATTESSA IV later underwent a revival of sorts via her new owner Dennis Washington, whose concept for the yacht included a new bow, new stern, new foredeck tender garage, new spa, new superstructure shape, all new helipad, and totally new interior layout, with updated crew areas. You’ll find another of ATTESSA IV’s more arresting features on the guest deck, where the lobby becomes an enormous passageway, while also offering access to the walk-around side decks and side terraces. MADAME GU | 99m Feadship – She was the largest superyacht ever built in the Netherlands at the time of her launch in 2013. MADAME GU is sleek + quick, boasting a top speed of 24 knots by way of her four MTU M73 diesels. She features exquisite exterior detailing and is bound to turn heads with her substantial helipad found on the foredeck. PLANET NINE | 73m Admiral – Indeed, suitable for global cruising, PLANET NINE features a commercially approved helideck (built for landing helicopters up to eight tons) and an enclosed hangar below, perfect for stowing your air toys while underway. With her massive volume (2,100 GT) from her nearly 13m (42’) beam, the interior offers not only spectacular space in all areas but a contemporary design by Zervudachi that is light, modern and airy. 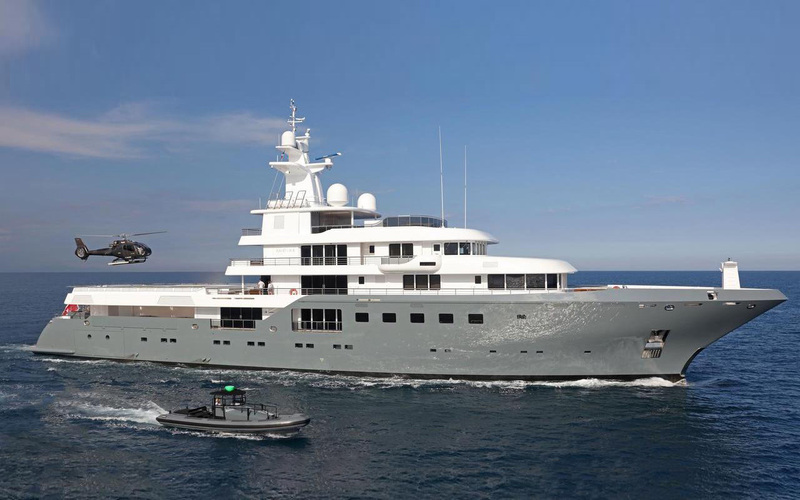 CLOUDBREAK | 72m Abeking & Rasmussen – She’s been called “a high-tech floating chalet” with a superyacht helideck (also certified for commercial use) for her custom Bell 429 Global Ranger. CLOUDBREAK owes her name to a wave in Fiji that daring surfers rank among their favorites, and she features a ski room, fireplace, sauna, massage room + chilled plunge pool. She’s luxurious and sophisticated, evidenced by little touches such as automated doors and heated floors in the showers.